Scientists explain how mosquitoes attack human. 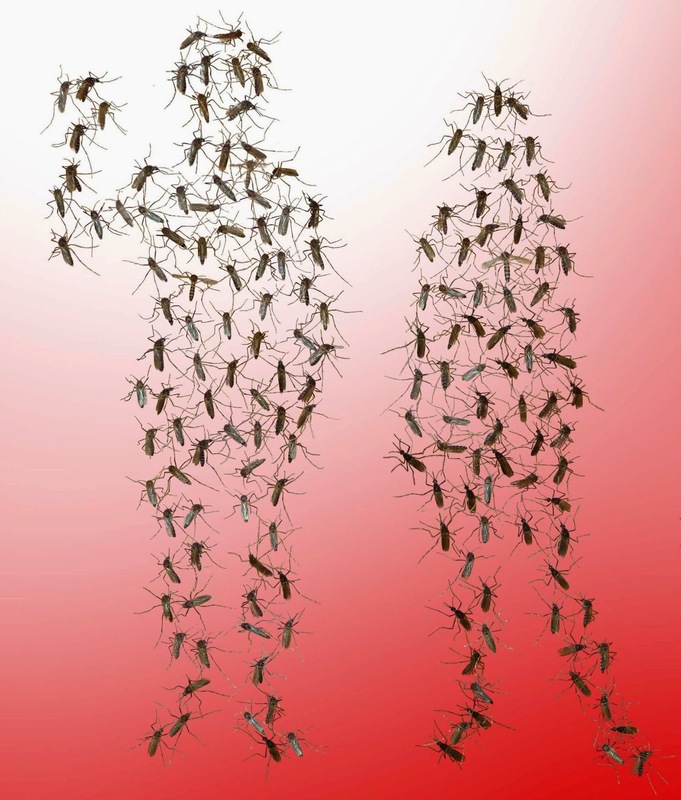 Mosquitoes are drawn to human skin and breath. Credit: Genevieve M. Tauxe, Ray Lab, UC Riverside. Recent research done by scientists at the University of California, Riverside can now help address these questions. They report on Dec. 5 in the journal Cell that the very receptors in the mosquito's maxillary palp that detect carbon dioxide are ones that detect skin odors as well, thus explaining why mosquitoes are attracted to skin odor – smelly socks, worn clothes, bedding – even in the absence of CO2. "It was a real surprise when we found that the mosquito's CO2 receptor neuron, designated cpA, is an extremely sensitive detector of several skin odorants as well, and is, in fact, far more sensitive to some of these odor molecules as compared to CO2," said Anandasankar Ray, an associate professor in the Department of Entomology and the project's principal investigator. "For many years we had primarily focused on the complex antennae of mosquitoes for our search for human-skin odor receptors, and ignored the simpler maxillary palp organs." Until now, which mosquito olfactory neurons were required for attraction to skin odor remained a mystery. The new finding – that the CO2-sensitive olfactory neuron is also a sensitive detector of human skin – is critical not only for understanding the basis of the mosquito's host attraction and host preference, but also because it identifies this dual receptor of CO2 and skin-odorants as a key target that could be useful to disrupt host-seeking behavior and thus aid in the control of disease transmission. To test whether cpA activation by human odor is important for attraction, the researchers devised a novel chemical-based strategy to shut down the activity of cpA in Aedes aegypti, the dengue-spreading mosquito. They then tested the mosquito's behavior on human foot odor – specifically, on a dish of foot odor-laden beads placed in an experimental wind tunnel – and found the mosquito's attraction to the odor was greatly reduced. Confident that they were on the right track, the researchers then zeroed in on two compounds: ethyl pyruvate, a fruity-scented cpA inhibitor approved as a flavor agent in food; and cyclopentanone, a minty-smelling cpA activator approved as a flavor and fragrance agent. By inhibiting the cpA neuron, ethyl pyruvate was found in their experiments to substantially reduce the mosquito's attraction towards a human arm. By activating the cpA neuron, cyclopentanone served as a powerful lure, like CO2, attracting mosquitoes to a trap. "Such compounds can play a significant role in the control of mosquito-borne diseases and open up very realistic possibilities of developing ways to use simple, natural, affordable and pleasant odors to prevent mosquitoes from finding humans," Ray said. "Odors that block this dual-receptor for CO2 and skin odor can be used as a way to mask us from mosquitoes. On the other hand, odors that can act as attractants can be used to lure mosquitoes away from us into traps. These potentially affordable 'mask' and 'pull' strategies could be used in a complementary manner, offering an ideal solution and much needed relief to people in Africa, Asia and South America – indeed wherever mosquito-borne diseases are endemic. Further, these compounds could be developed into products that protect not just one individual at a time but larger areas, and need not have to be directly applied on the skin." Currently, CO2 is the primary lure in mosquito traps. Generating CO2 requires burning fuel, evaporating dry ice, releasing compressed gas or fermentation of sugar – all of which is expensive, cumbersome, and impractical for use in developing countries. Compounds identified in this study, like cyclopentanone, offer a safe, affordable and convenient alternative that can finally work with surveillance and control traps. The team tested the efficacy of ethyl pyruvate in the lab on Aedes aegypti using an arm-in-cage set-up (the experimenter's hand was gloved and not exposed to mosquito bites or the test chemicals). The researchers tested the efficacy of cyclopentanone as a lure on C. quinquefasciatus, the mosquito that spreads West Nile virus and filariasis, using traps in a modified greenhouse at UC Riverside. GM Tauxe et al. Targeting a dual detector of skin and CO2 to modify mosquito host seeking. Cell DOI: 10.1016/j.cell.2013.11.013 (2013).